Halloo - What is the easiest way to record audio greetings? What is the easiest way to record audio greetings? The easiest way to record audio for your voicemail outgoing message and auto attendant is to have My Halloo call you so that you can speak your intended message. When you sign in to My Halloo, your can see and adjust your forwarding number on the Summary page. Navigate to the User Settings / Voicemail page. Click [Rec.] to open the Record Audio dialog box. Click [Dial] to have the Halloo system initiate the call to enable you to record your greeting. 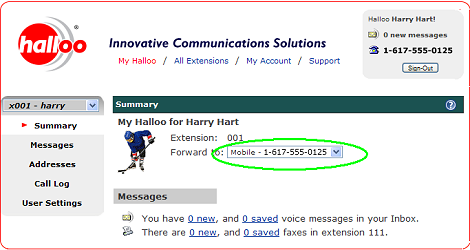 When you click [Record], the Halloo system will call your telephone, not the number of the extension for which you are recording. Make sure that your telephone is ready to receive incoming calls. We suggest that you use a “landline” telephone, preferrably not cordless, to ensure the highest quality audio. Changing the dialed number in the Record Audio dial box will change your the forwarding number associated with your extension. Make sure to change it back after you are done recording, on either the Record Audio window or on the Summary tab of your user extension. This feature will use standard Halloo plan minutes, so preparing your message in a written script may be helpful. Click on the name of the menu greeting you would like to change to show the menu details. 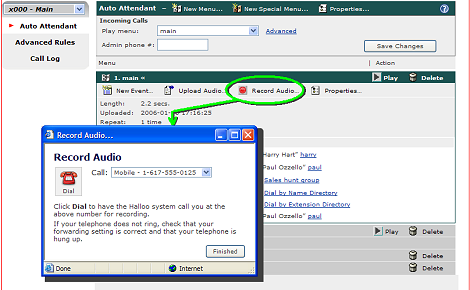 Click [Record Audio] to have the Halloo system initiate the call to enable you to record the audio greeting.